Now that Robin and I have (more or less!) settled in and settled down from our move, I’ve had the urge to add a few new pieces to that glorious walk-in closet of mine…so yes, dear readers!! I’ve done some shopping!! Finding the “perfect” grey skinny jeans had actually been on my mind since waaay before packing ever was; after all, what kind of a fan of neutrals could I possibly be without a basic like this in my denim line-up…am I right?! I’ve been pleasantly surprised by the fit and quality of jeans from Forever 21 before, and these are definitely no exception; they sit nicely on the hips without gaping, the denim is wonderfully soft and stretchy, and a small cuff takes care of the length…no hemming required!! P.S. Remember – it isn’t just Friday…it’s Fun Fashion Friday!! 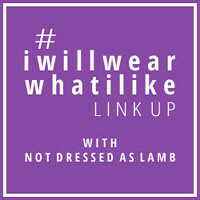 Why not visit Fashion Should Be Fun and join the linkup party with me?! Previous Post Kicking it: gingham skirt, chambray shirt, and booties with attitude! Those jeans really do fit you well and flatter your slim figure, and your outfit reminds me of Keith Richard's graphic-glam. Although I love neutrals, at 56 my skin has become a bit sallow, so I usually add color around my face with a collar or scarf, but your luminous skin handles the grey! Love your gray on gray! I got some charcoal gray skinny jeans last year and was disappointed that in pics they just look like black pants that I've had too long. lol. Your a doll for always mentioning FFF! Hi Monika! So good to visit your blog, feel like I've missed so much. Life has been busy, but luckly I got to visit today. I am loving this outfit, and will you introduce us to your new closet at some point? I agree Forever21 jeans are awesome, fit, and comfort are the best. Happy Fall season, and I'll check out the link up. Also I just followed your Instagram, so that I don't feel like I miss so much incase I don't get to do regular blog visits!